When you think of Superman, you likely envision a robust looking fellow with bulging muscles and a suspiciously well-coiffed head of curls. It's hard to envision such an immortal cultural figure growing older, weaker, and even one day, passing away. Argentina-based photographer Romina Ressia visualizes what our subconscious cannot in a series entitled "Not About Death." 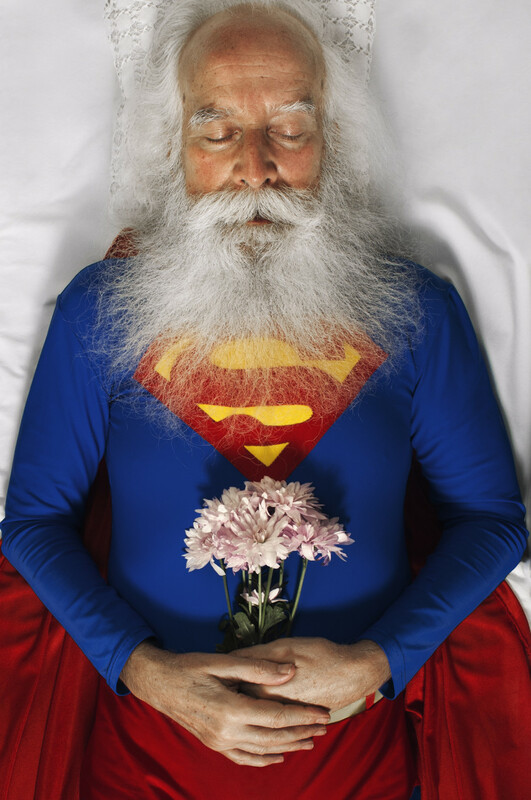 The jarring photographs chronicle Superman, Snow White and Wonder Woman as elderly folks, still donning their uniforms. But instead of the flowing manes and perfect complexions of comic or fairy tale youth, the characters are shown sporting grey hair and wrinkled skin, resting in their coffins after death. "It was a challenge because I know that people tend to feel uncomfortable in front of the passage of time and death," Ressia explained in an email to The Huffington Post. "Mainly when the people in the coffin were characters that have been with us since our childhood and that we are not ready to imagine in this way." Ressia recruited Nestor, a 75-year-old widower who'd recently taken up acting and dancing to play Superman, and Cornelia, a 94-year-old grandmother with a strong sense of humor, to play Snow White. For Wonder Woman, Ressia recruited a personal friend named Virginia, who'd long watched over her godson. Despite the dark content of Ressia's series, the vibrant participants made the experience full of life. "This project explores how we stand faced to the real world, as individuals, with the baggage we bring, which has been inculcated to us through cartoons, comics and fictional characters throughout our childhood. As many other children, I have grown up with the ideals of omnipotence, beauty, physical and supernatural powers. I have been told that evil never wins; that if I am in a dangerous situation, somebody else will save me, and that all stories have a happy ending. This series explores how strongly those values and beliefs have been incorporated into the collective memory." See Ressia's work below and let us know your thoughts in the comments. You may want to keep these away from the kids.